James C. Wimbush’s first brush with racism came early. As a four-year-old growing up in civil rights-era Virginia, Wimbush remembers stopping at a rural gas station with his father. Wimbush ran for the entrance to buy some snacks, but his father quickly pulled him back before gesturing to two signs above the doors. Wimbush could not read at the time, but the message the two signs conveyed stuck with him. “He was pointing to the door I had to go in, letting me know an important life lesson for that period: that I couldn’t go through the door that said, “whites,”” Wimbush said. It would not be Wimbush’s only encounter with issues of discrimination. When Martin Luther King Jr. visited Danville, VA, Wimbush remembers going to the hospital with his parents to visit neighbors and family friends who had marched with Dr. King and had been injured by police beatings or attack dogs. Later on, throughout his undergraduate and graduate education, he experienced treatment from fellow students and professors that suggested they did not truly consider him their peer. From an early age, such experiences convinced Wimbush of the importance of building diverse and inclusive environments--a conviction that informs all that he does today at Indiana University. “If we don’t create environments that are welcoming, and where people feel a part of the place, it’s very difficult for them to avail themselves of the opportunities that come as a result of the higher education experience,” Wimbush said. Today, Wimbush acts as Indiana University’s vice president for Diversity, Equity, and Multicultural Affairs, as well as the dean of The University Graduate School and Johnson Chair for Diversity and Leadership. In his 27 years at Indiana University, Wimbush has worked both as a faculty member in the Kelley School of Business and as an administrator. 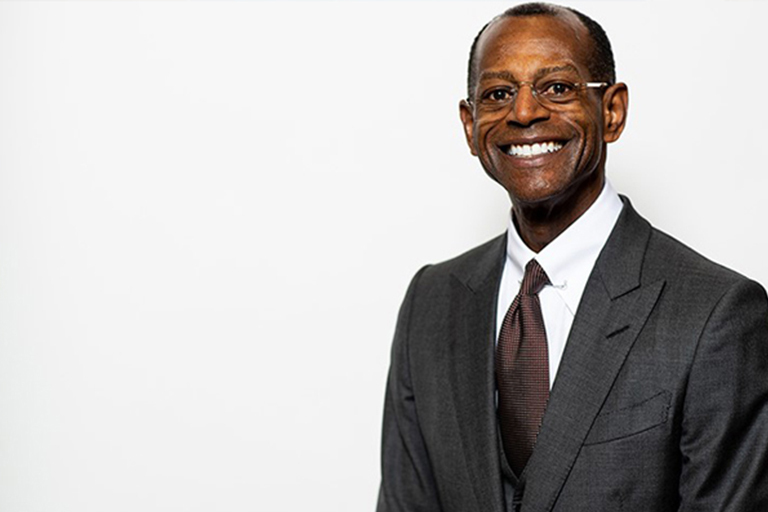 Now, his commitment to creating a diverse, equitable, and inclusive university has been recognized by Indiana Minority Business Magazine, which designated Wimbush as a 2019 Champion of Diversity Honoree. While he is honored by the recognition, Wimbush sees his role as one of a “traffic director” for Indiana University’s diversity and inclusion initiatives--initiatives that would not exist at all if not for the hard work of students, faculty, and staff. “We have a lot that’s going on by a lot of different people, and it’s by all the work of all of these individuals that we’ve been able to have such accomplishments in recent years,” Wimbush said. The results of this hard work have helped IU make all of its campuses more diverse and welcoming spaces for all who call them home. The university has set numerous records for minority student attendance; in the 2017-2018 year, for example, Indiana’s percentage of minority students grew to 24.1%, a higher figure than the minority population of Indiana as a whole. Under his leadership, Indiana University’s campuses have also received numerous accolades for its diversity and inclusion work, including HEED Awards from Insight Into Diversity Magazine and the inclusion of the Bloomington campus on Campus Pride’s Best of the Best LGBTQ-Friendly Colleges & Universities list. Wimbush is especially proud that retention of students from historically underserved communities has increased in recent years, as well--a sign that Indiana University is better serving the needs of all of its students through graduation and beyond. Doing so is especially important to Wimbush because of his own educational experience. Though he faced alienating treatment by some, the relationships he made with a few key professors helped convince him that fostering education was the path for him. Now, having worked in higher education for decades, his conviction of the importance of diversity and inclusion is stronger than ever. “I have always viewed it as very important to make sure that, as Herman Wells would say, people can be in an institution and do their very best work,” Wimbush said.